If you need a healthy, fun snack for Memorial Day, Flag Day, or Independence Day, this is perfect. Simply skewer the fruit to look like a flag. It doesn't get much easier. 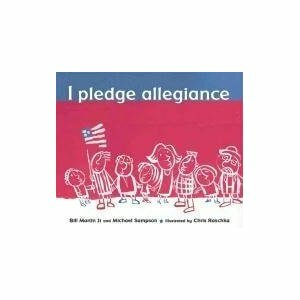 Check out I Pledge Allegiance by Bill Martin Jr. and Michael Sampson and illustrated by Chris Raschka. This is the best book I have ever seen to help kids understand the pledge of allegiance. Clever! My kids would love to make this for Memorial Day. Great snack! I love 4th of July! This is such a wonderful idea! It looks great and is made of such healthy fruits. Love this! We had lots of berry treats for 4th of July too, but I didn't think of making a flag -- great idea & so healthy!! You have my permission to pin my content!